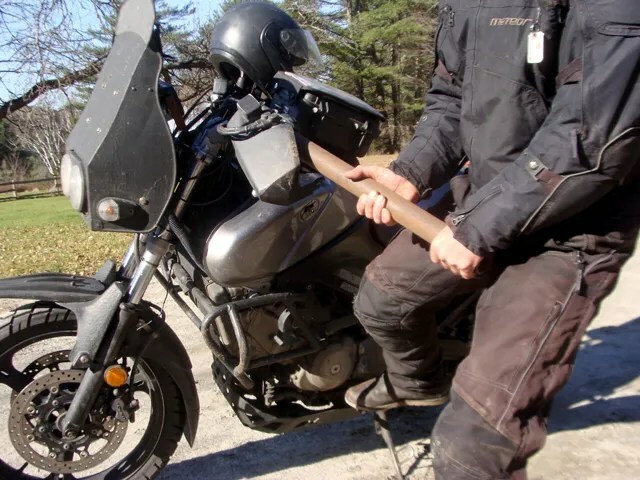 An idea began to percolate in my head; the next day was payday…….rent had already been paid the week before……why not put off paying some bills for another week…….and ride to Magog, Québec? Oh, how I love it when a plan comes together! I dashed back over to my house and shot off an e-mail to my friend Scott, inviting myself to stay at his house, in Milton Mills, NH, for Friday night. It was one of those “Number Ten” days on Friday, when I left for New Hampshire. I arrived late in the afternoon at Scott’s. That night, we sat in his living room, drinking beer, eating pizza, and talking about “life”. I left Scott’s place around 7:30am Saturday morning. I had to scrape a heavy frost off of the seat of my bike and also off of my mirrors. Scott said, “Remember to watch out for that in the road, too.” “Yeah, I have been ‘down’ that road before!” I told him, (and that was literally!). I rode up to Meredith, New Hampshire, where a former high school, classmate of mine is now living. Peter Louden owns, Interlakes Automotive Repair, and lives right near where his business in located. During my hour long visit with Pete, we figured that we might have seen each other briefly at a class reunion, but realistically, probably hadn’t seen each other since we graduated from high school in 1976. 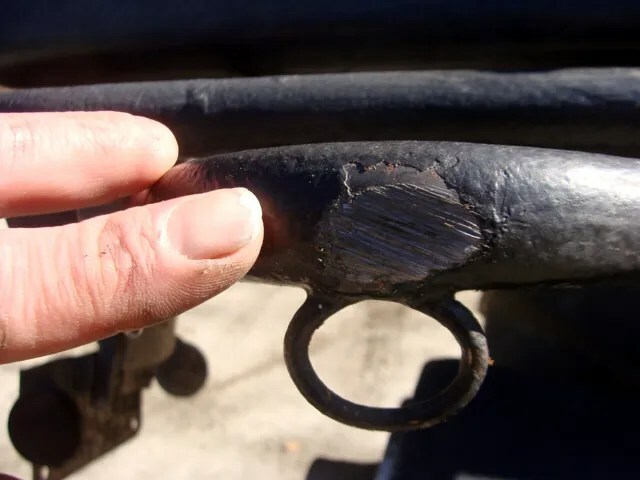 Pete’s business specializes in antique automotive restoration. He is also into flying and planes. Here is a photograph of Peter and me. I left Peter’s house and once on the road, headed North, I got to thinking about the possibility of making a brief stop at another friend’s house located in, South Ryegate,Vermont. I had been to Tom’s house before, and we have ridden a little bit together. I could alter my route to pass through his town. When I got to Woodstock, NH, I called and left a message on the answering machine at Tom’s house. 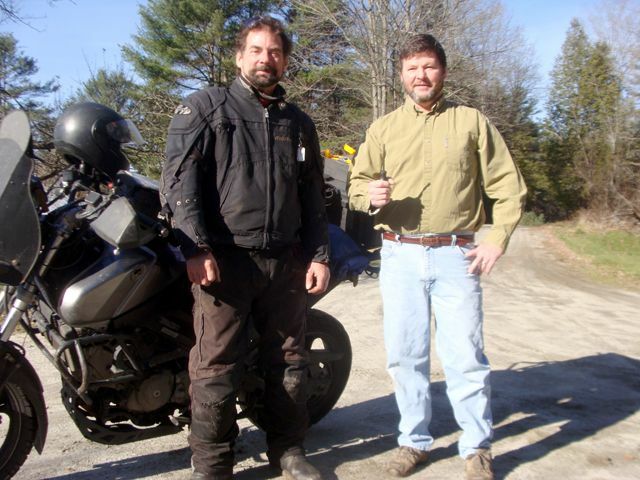 My route of choice was to ride up Rt 112, from Woodstock, to Woodsville, NH, then into, Wells River,Vermont. I would try to contact Tom again in, Wells River. I like Rt 112. I have ridden it several times over the past four years. It has some “twisty turns” to it, and I can get into a “flow” when moving at a good clip. It was bright and sunny this morning, and beginning to warm up. I was riding at around 50 – 55mph, which is above the posted speed limit; but I was enjoying the freedom and getting lost in the moment and carving turns. …….and the bike was gone…….. 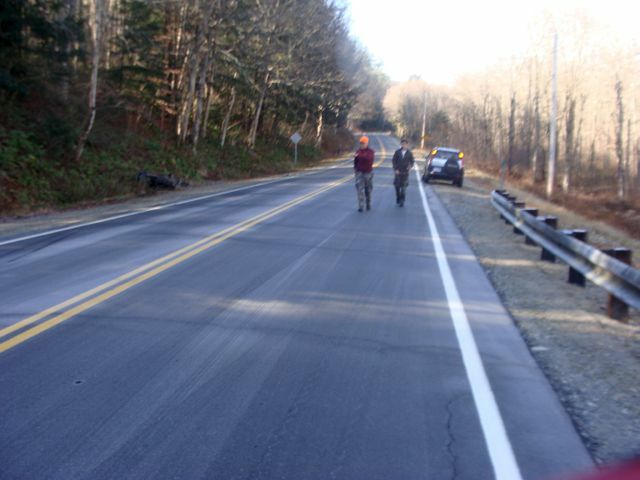 In as “fast-as-fast-can-be”, measured in milliseconds, the bike and I were sliding, together down the road. At one point, during this “horizontal journey”, I saw a whole bunch of sparks in front of my eyes. A voice inside of me said, “Cool. Get the camera. Take pictures.”. I really didn’t have the time to reach down, release my lens cap, and start firing shots at the sparks shooting out from underneath my bike. But, the idea did occur to me though; just for an instant. Both, the bike and I came to a stop, in a trench on the opposite side of the road. I stood up and took a photo of where the “Black Beast” lay. I took another photo from the front of the bike. I then walked back up towards the apex of the turn, I had just been trying to navigate. 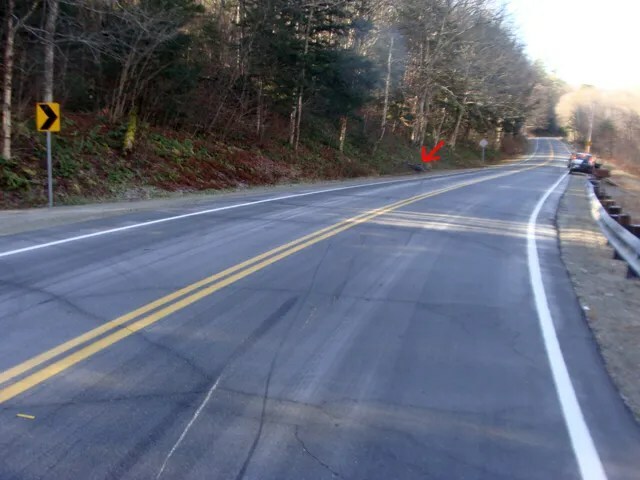 I followed the marks in the road that my bike and I made as we slid out of the turn. I got close to the point of “release” and took this photo. The “gouge” in the lower left-hand corner of the photo is where my right passenger footpeg began “carving” its own path through the turn. I was already down at that point. I took the photo here because it was sort of getting hard to see my bike in the distance! I have no doubts that we both slid over 100′. A small, silver car started around the bend and I made the “universal sign” to slow down. Which, the driver immediately tried to do, and nearly lost control of his vehicle! The driver and passenger got out of the car and started to walk towards me. It was very difficult for them to do, because the road was so slippery! The road was covered with a heavy frost; a “white ice”. We introduced ourselves and walked back to my bike. 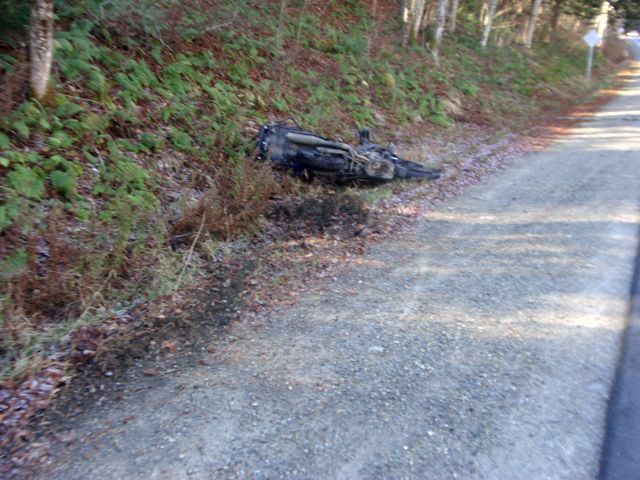 The bike slid on its right-side across both lanes of the road. As it entered the trench, it “fetched-up” and flipped over on to its left-side. Eric, (on the left), andTyler, (on the right), helped me pick up the bike and roll it on to the shoulder. I had trouble getting the bike into “neutral”. But, after several tries, I was successful. Also, although my voltmeter told me that I had enough power, and I could hear the fuel pump “kick in”, the bike wouldn’t start. So, I reached underneath the left handgrip and reattached the clutch safety switch. Eric’s eyes got real “big” at this when the motor fired right up. He couldn’t believe that the bike started. He also couldn’t believe it when I told him that I was going to ride it. Take a look at the above photograph where Eric and Tyler are standing next to my bike. Take a close look at the left handlebar grip. 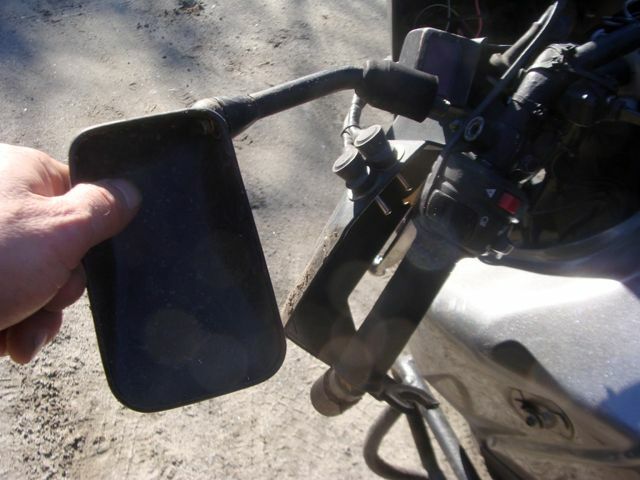 The clutch lever was bent fairly badly too. But, if the thing was going to run, and it was going to roll, I was going to ride it. Eric reminded me that there was a store about 2 miles up the road and that I could make a phone call from there to get help. He would follow me in his car. As I got the bike rolling and up to speed, everything seemed pretty much fine. I “slalomed” the bike a little bit to check for “wobbles”. There weren’t any. When I got to the store, I waved off Eric and Tyler and kept riding. 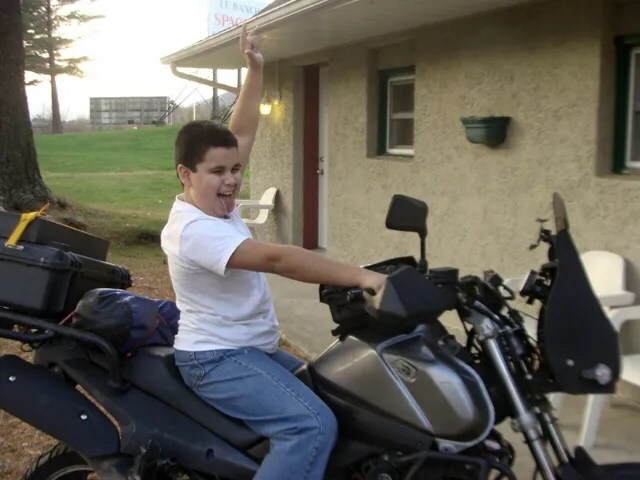 I now had my sights on getting myself, and my bike to Tom’s house. Tom is a metal fabricator and everything that I might need would be right there. It was a 40 minute ride away. Which I easily made! When I got to Tom’s house, I knocked on both doors. Only his dog answered. 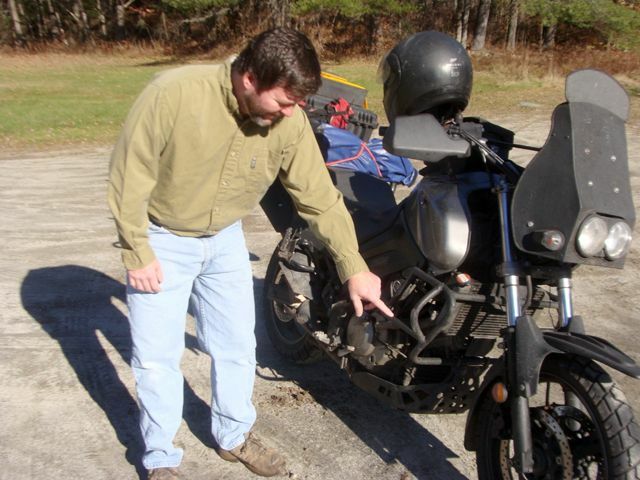 So, I went back to my bike and started to assess things a little more closely. I removed the left mirror. The glass was gone. I took a photo of the right side of my crashbars that I made last winter out of, 1/2″ black iron pipe. This area took the brunt of the force of the crash. The “hoop” was almost burned through from “road rash”. This is where the shower of sparks was coming from during the slide. 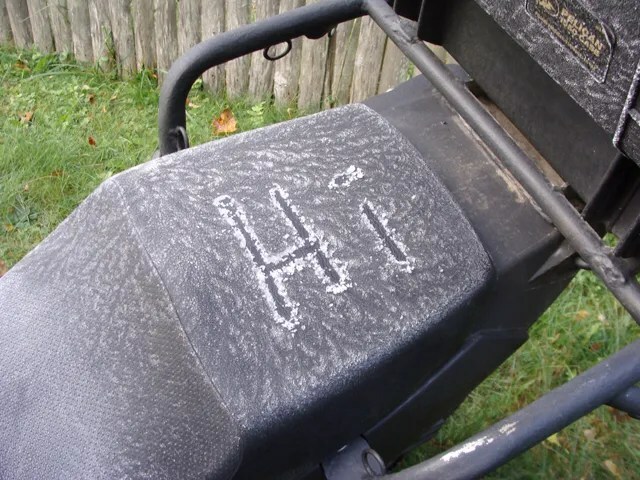 I took a look at the right side of my luggage rack. It too had some “grinding” on its “knuckle” as well. My right, passenger footrest was bent way out of place. Both muffler guards were broken as well. Now, check this out. This is something that I am very proud of. Here is a “head on” shot of my bike. At the very LEAST, I was traveling at 50mph. I am pretty sure that I was traveling closer to 55mph. My crashbars have NOT budged! They are still right on center. Last Winter, I didn’t have a clue as how to do what I was doing. I am not a metal fabricator. I am not a welder. But, I had an idea, that I felt strongly about, as being “better” then what you can find on the market for crashbars. The whole “system” worked perfectly. I got up. My bike got up. We both rode away; together. In the above photo, also check out the left handlebar grip. That was the main thing I had to try and take care of and I knew that I was in the perfect place to do it. I walked back to where I knew his metal, chopsaw was. I am a yacht carpenter; I know that there are always “cut-offs” nearby chopsaws! I found what I was looking for right underneath the saw. 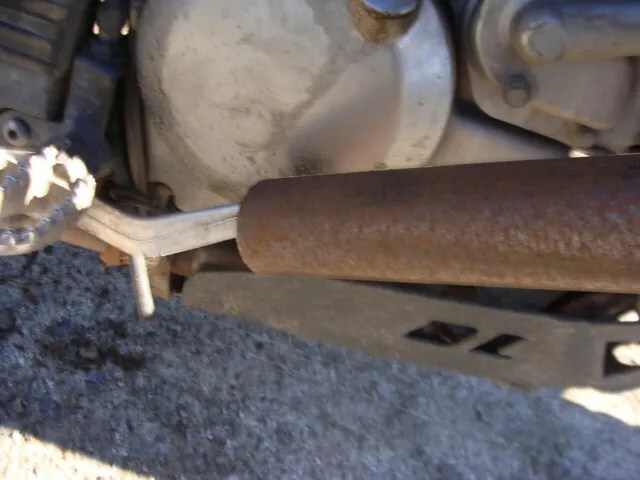 With the short section of pipe in my hand, I walked back outside to my bike and slid the pipe over the end of the handlebar grip. I lifted up, bending the grip back to roughly where it should be. 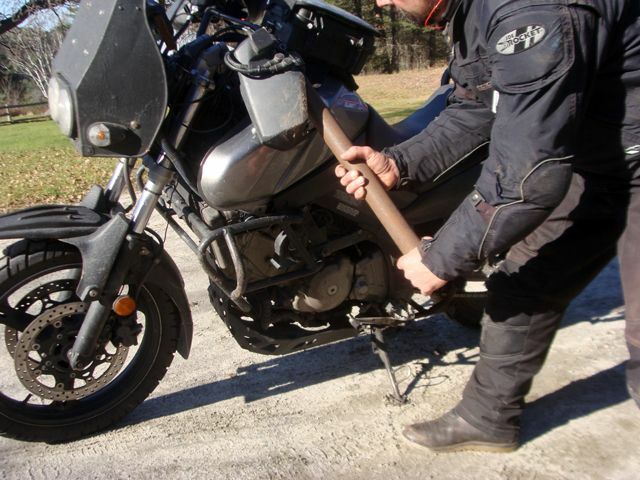 I did the same with the clutch lever. 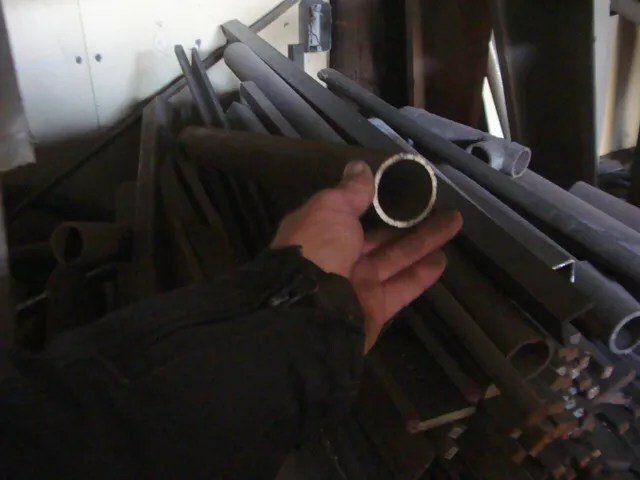 I found a larger diameter piece of pipe that I bent the footbrake peddle out and away from the motor casing. 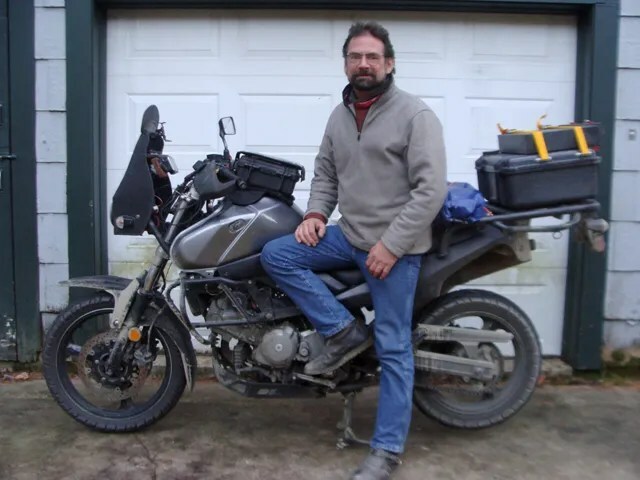 With my work done, and the two pieces of pipe returned to Tom’s shop, and the door closed, I knelt down in his driveway to begin planning my new route to Magog from, South Ryegate, VT.
Just as I finished putting my maps away, I hear a door open and close and a familiar voice say, “I recognize that bike!” It was my friend, Tom! He had been inside taking a shower and didn’t hear his dogs bark. “How long have you been here?”, he asked. “About a half hour!”, I replied. Tom checked out the damage to my bike. And we took an “annual” photo together. 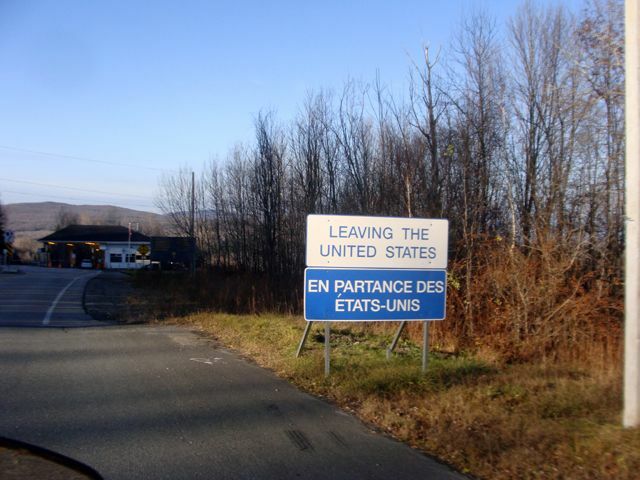 I shoved off, and made my border crossing into Québec……. …..and up to Magog to, Rancho du Spaghetti, where I have stayed several times before. 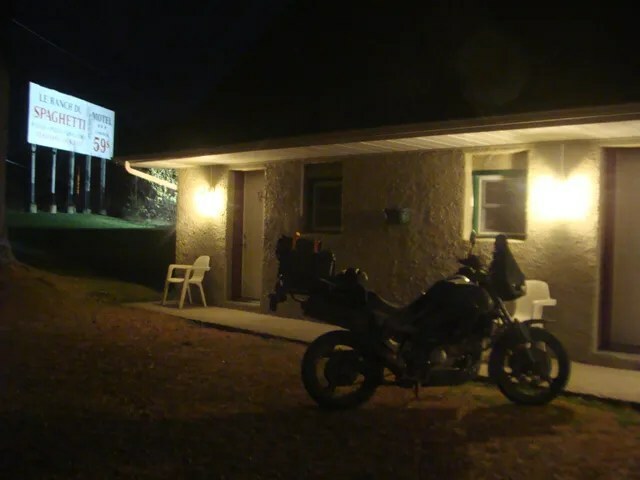 After checking in at the front desk, I was assigned a room, and I rode over to where I would be sleeping for the night. I met “Johnny” in the parking lot. And, his parents, “Richard” and “Konwenni”. I unpacked, took a shower and took a photo of my riding pants. Nothing else was ripped or torn. After dinner, I took a “night photo”. 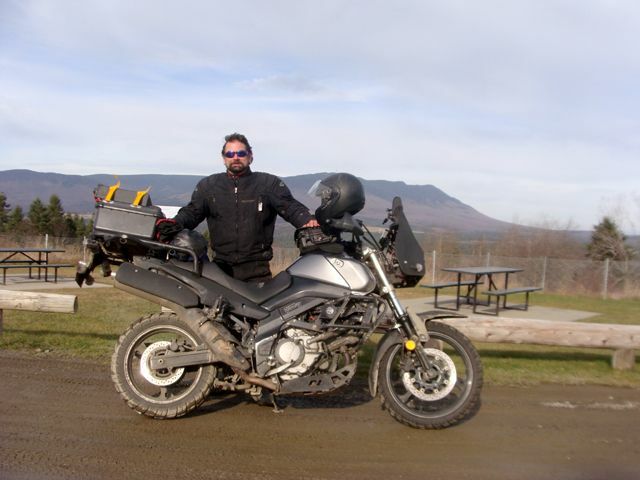 In the morning, I followed my usual route of mixed, paved and dirt roads back to Maine. There was some snow alongside some of the roads. As I got close to Ellsworth, Maine, I found a couple parked on the side of the road. I stopped to say “hi” to them. Their names are, “Marcus”, and “Meagan”. 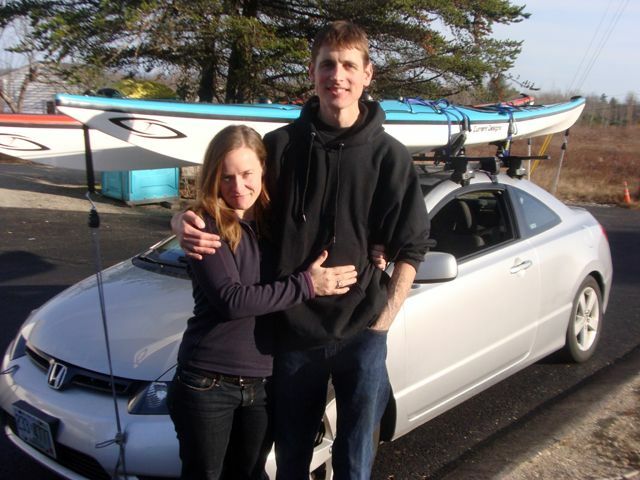 They had driven up from Portsmouth, NH, to purchase two sea kayaks from a local sporting goods store located in Ellsworth, Maine. The reason I stopped to say “hi” to these happy folks was, I designed the sea kayak that is on the driver’s side of their car. It is the, “Caribou” built by Current Designs. That’s it! 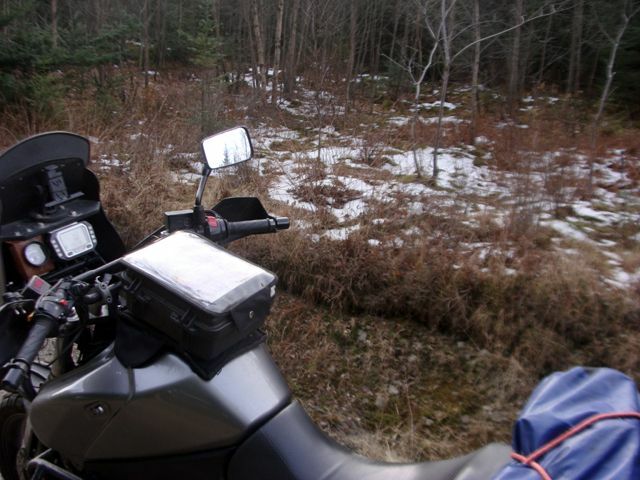 I returned home safe and sound………and finished up riding for the 2010 season! 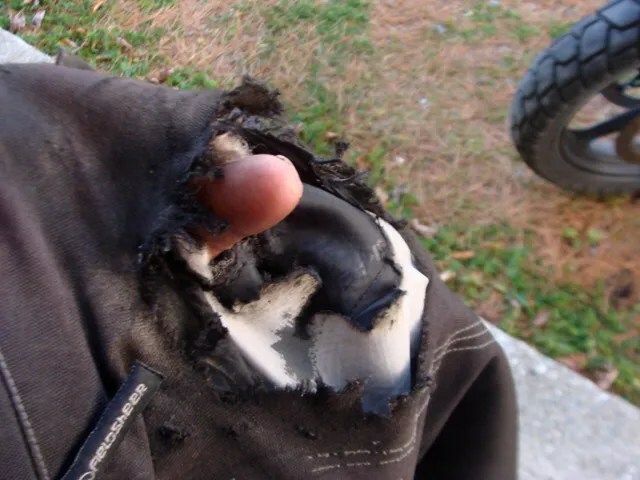 I’ve read a number of posts of yours at the stromtrooper site.This is my first visit to your site.This is an interesting write-up of your crash.You didn’t share much about how your body endured your crash.I see you wear good gear and it seemed you just went down on the low side and slid and didn’t hit anything.Everyone would wish for this if we have to go down.Did you feel any effects later?Any aches or bruises? No effects at all. And yes, I was very, very lucky no one was coming in the opposite direction. The bike slid in front of me, and I slid behind it. Unfortunately(? ), I was turned around and facing the direction of where I hit the pavement, as I slid along. I could not get myself turned around to be able to see what was going on! I do remember thinking to myself, “Boy, all of that steel on my bike, sure puts out a lot of sparks!” I wanted to grab for my camera and take a photos of the shower of sparks I was being engulfed in! 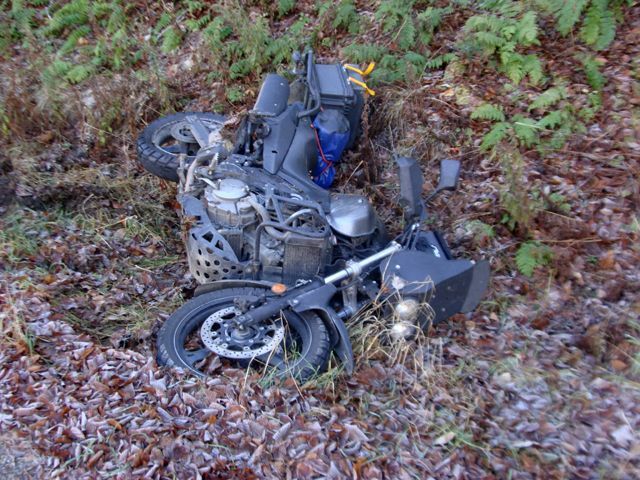 The bike did “low slid” all the way to the ditch. Once in the ditch, there was enough energy for it to flip up and over to the “high side”. 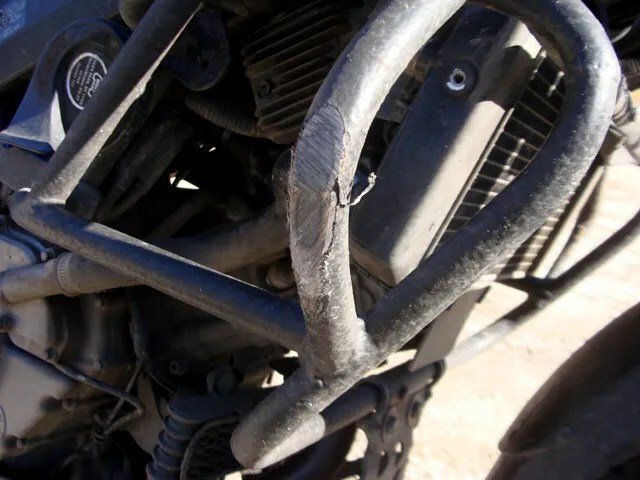 When it came down on the left side, that is how the left handlebar got bent downward. I just found your site while researching the oil leak from my v stroms water pump. What a great site!! 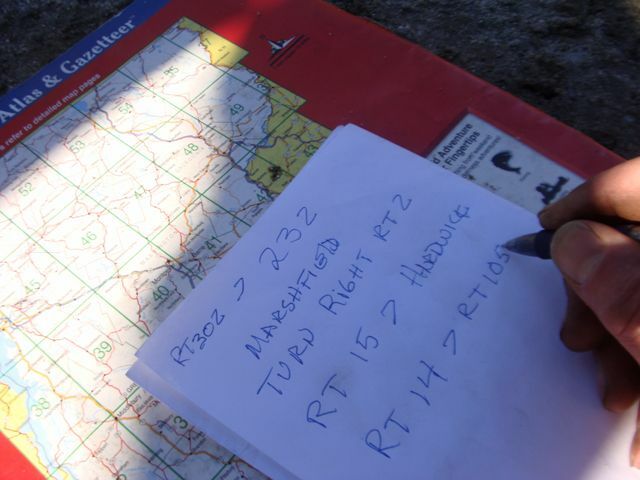 I’ve enjoyed reading about your adventures and the water pump write up is spectacular with the pics. I wish I lived closer (I’m in southern California) as I’d love to ride with you. None of my riding buddies seem inclined to take more than day trips. I have taken one solo 3 day trip so far and plan more in the future. Best regards, Glen. 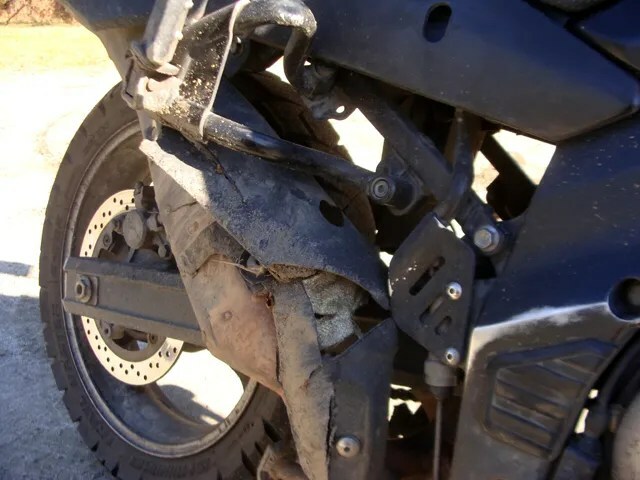 some details on how did you make those crashbars would be great. 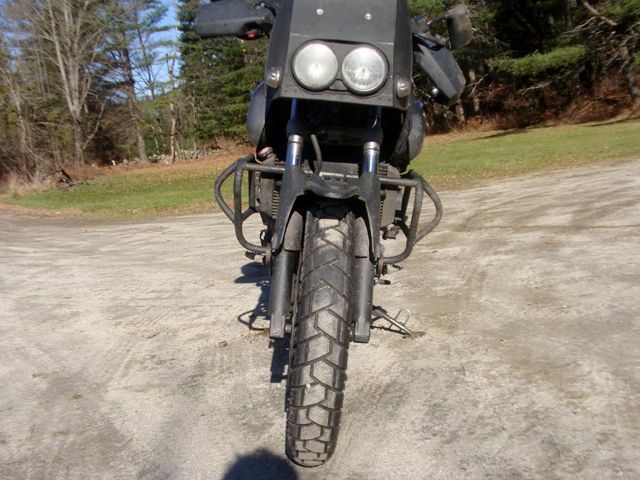 The crashbars were designed and made by me; using “black iron pipe” that I purchased at my local Home Depot store. I cut the parts, bent the parts and gas welded all of the joints. That’s about all that I remember! I fabricated them about seven years ago, and I have tackled MANY MORE projects since then. The results of which really cloud the mind as to “what I did”. After awhile, all of my crazy projects kind of blend together! Sorry that I can’t be of more help! 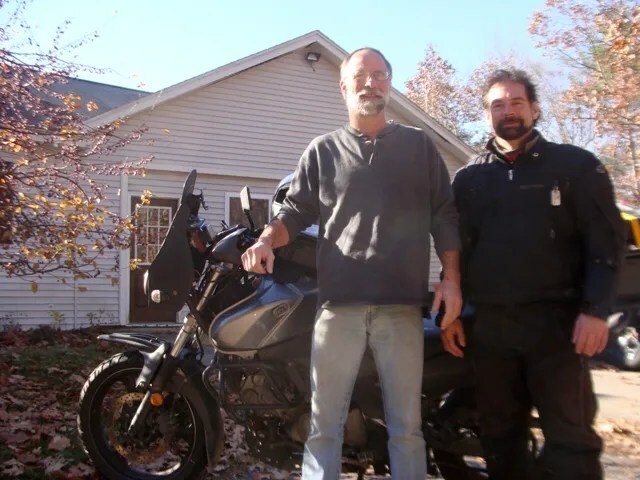 I gave my VStrom away in a charity fundraiser back in 2012. I turned around and purchased a 1993 KLR 650. 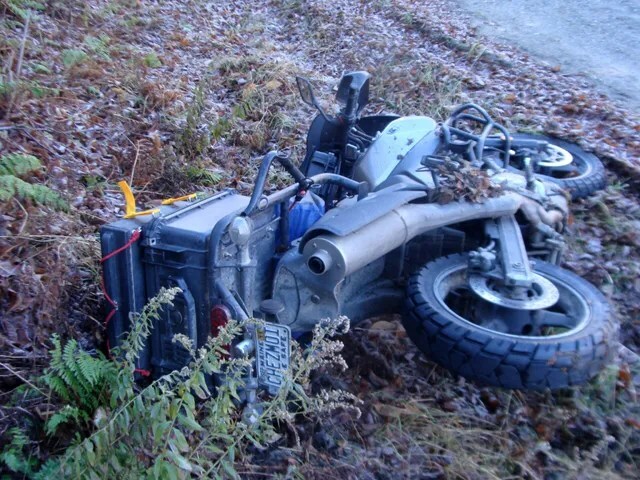 During the winter of 2012 and 2013, I completely tore down that motorcycle, including the engine. 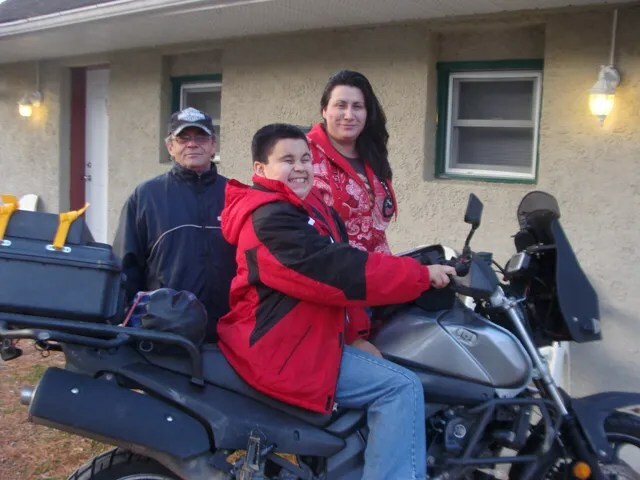 In August of 2013, I rode the KLR from my home in Maine, across Eastern Québec, Labrador, Newfoundland, Cape Breton, Nova Scotia, and New Brunswick; back to my home in Maine. (A nine day trip.). I sold the KLR in 2015. I am restoring an old wooden sailboat as my next project.